Our expert martial arts instructors pride themselves on having an in-depth knowledge of Kuk Sool. Our instructors are well versed, professional and internationally certified. They combine their countless years of Kuk Sool training and teaching to develop a personal and constructive relationship with each and every student. Our teaching style sets a high standard, resulting in a more confident and successful student. Our positive influence leads students to achieve their goals, not only at KSMY Martial Arts, but also in their personal lives. 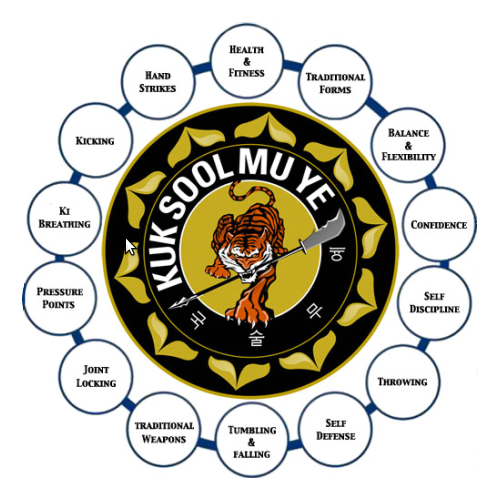 While all martial arts styles strive towards the goal of character building, Kuk Sool combines all of the different physical and mental aspects of martial arts into one comprehensive curriculum that is challenging and enjoyable to learn! We do not believe in contracts. By not requiring contracts, our school is disciplined in a different way. It’s not about simply finding new students, but about growing a following. This turns our focus to retaining and growing our students by offering the best experience possible. This allows us to identify and reach the right kind of student – someone who will value the training and continue for a long period of time. By not trying to trap students through contracts, our school makes sure that the service we offer keeps students coming back. Our school truly values the fact that our students attend lessons simply because they want to be here, not because they feel stuck due to a contract. Welcome to the world of Korean historic martial arts! In this synopsis, we will briefly explore the history of Kuk Sool, and the purpose and authority of the Korea Kido Association, the World Kido Federation and Han Min Jok Hapkido Association. The history of Korean martial arts is as old as the land itself and can be traced as far back as the prehistoric era, where primitive weapons made of wood and stone were used for hunting and fighting. As early as 2707 BC, the Korean warlord Chi-Woo, also known as Jaoji, reigned as the “god of war” in what is now mainland China. Since then, the majority of Koreans migrated and settled in the Korean Peninsula, where there have been more than a thousand recorded instances of foreign invasions. Consequently, the Korean people developed unique martial arts and military strategies to defend themselves and their territory. Most of these martial arts fall into three groups or branches - Tribal, Buddhist and Royal Court martial arts. The earliest martial arts developed in Korea are referred to as Sa Do Mu Sool; meaning tribal, clan, or family martial arts, as this type was mainly passed down from one generation to the next through family lines. Sa Do Mu Sool was popular among the ancient tribes, city-states, and smaller kingdoms that formed in the Korean Peninsula and parts of what is now China. This was evident well before the first unified Korean kingdom of Ko-Cho Sun which was founded in 2333 BC by the legendary king, Dahn Gun Wahng Guhm. Later, Sa Do Mu Sool was refined and dispersed by voluntary militias comprised of the common people, who often fought in battles to defend their villages. Traditional athletic activities such as Taekkyon, and Ssireum are considered to have originated from Sa Do Mu Sool. In fact, many techniques found in the popular Olympic sport of Tae Kwon Do can also be traced back to Sa Do Mu Sool. Buddhism was first introduced to the kingdom of Koguryo in the year 347. As such, a rather unique form of martial arts was developed by both Buddhist monks and martial artists, known as Bul Kyo Mu Sool. Buddhist monks developed and practiced Bul Kyo Mu Sool to not only improve their health while meditating but also to defend themselves while traveling. These resourceful monks developed a dynamic and unique system of self defense techniques which combined manipulation of pressure points with joint locks. This enabled them to subdue and control an assailant without necessarily inflicting lethal harm, which would be counter to their beliefs and way of life. The Kuk Sool curriculum incorporates more than 360 joint and pressure point techniques that were utilized by Buddhist monks. Buddhist martial arts includes internal training, with emphasis on special breathing and meditation methods, as well as external training, which incorporates extremely effective self-defense techniques. Many Buddhist monks were so accomplished as martial artists that they were occasionally called upon during national emergencies to fight in battles by forming unprecedented armies of warrior monks. To this day, Bul Kyo Mu Sool plays a significant role for Korean martial artists by providing them with philosophies of non-violence and compassion as well as ethical codes of conduct. Kings, royal families, and government officials had private armies and bodyguards who practiced a type of martial art known as Kung Jung Mu Sool. These royal court martial arts gave rise to esoteric techniques of easily portable weapons such as short swords, folding fans, ropes, scarves, and walking cane (which was modified into an offensive weapon sporting concealed swords or poison spikes placed in the tip). These weapons had a completely benevolent appearance that helped to preserve a peaceful public decorum for the Royal Court. Although the sword had its beginnings in Sa Do Mu Sool, it became the weapon of choice for military men and many sophisticated and varied techniques developed in the Royal Court through centuries. Other military weapons taught in Kuk Sool include the spear, trident, and the crescent moon sword. Along with these weapons, there were many unique and advanced open handed and joint-locking principles of Kung Jung Mu Sool that are used extensively in Kuk Sool. Existing records in Japan suggest that many Kung Jung Mu Sool techniques found their way there and gave birth to the Japanese art of Jujitsu. King JinHung of the Shilla kingdom encouraged the HwaRang warriors to practice Kung Jung Mu Sool in addition to their other martial arts training. But later during the Koryo Dynasty and Chosun Dynasty, Korean kings enforced policies to discourage the practice of martial arts and to forbid the possession of weapons, in order to protect themselves from military rebellion or other political uprisings. However, Korean martial arts continued to develop both inside and outside of the royal courts, thanks to the efforts of many dedicated Korean martial artists who practiced, recorded, and compiled these precious martial art techniques. Many events led to the formation of the current martial art system known as Kuk Sool. Perhaps the best place to begin would be 1910, with the dissolution of the Korean Royal Court by the occupying Japanese forces. During this period of foreign rule (from 1910 until the end of World War II), the Japanese attempted to suppress virtually every aspect of Korean culture and replace it with their own, including martial arts. As a result, many prominent martial arts instructors were forced into hiding. A few martial artists were well-noted for teaching three types of Korean martial arts; Kwun Sool: a kicking and hard punching style, Yoo Sool: a soft style with emphasis on joint-locking and throwing techniques, and Yoo-Kwun Sool: a combination of the two which could be either hard or soft but never used force against force. Many of the martial arts techniques native to Korea were extremely guarded and only taught in secret. Anyone caught teaching them faced severe punishment under a very strict legal system. Because of the severity of this repression, very few Koreans actually participated in martial arts activities for fear of reprisal. There were a handful of martial artists who chose to honor their family traditions of practicing martial arts. They set about with the task of preserving their vast martial arts knowledge. These dedicated martial artists continued practicing and teaching their techniques in the strictest privacy to immediate family members. Brother In Hyuk Suh and In Sun Seo were among the chosen recipients of this vast knowledge of martial arts. Possessing natural skills and talent, the two traveled throughout Korea studying the many traditional martial arts of the country. They soon discovered that, while all had important and valuable techniques, no style contained the entire spectrum of Korean martial arts in its curriculum. It was this fact that led the brothers to select and combine the most important of these methods from all three martial art categories - Tribal, Buddhist, and Royal Court - into one organized and complete system of martial arts, which we know today as Kuk Sool. Kuk Sool was officially founded as Kuk Sool Won in 1961, under In Hyuk Suh. Shortly after, the brothers formed the Korea Kuk Sool Association. Over three decades ago, the Korea Kuk Sool Association opened its doors to the headquarters do jang located in Busan, South Korea, which continues to this day as the association’s headquarters. The brothers faced numerous hardships and obstacles trying to reestablish the integrity and ethics of the martial arts at a time when martial artists were more frequently viewed by the public as gangsters rather than the gentlemen of martial arts tradition. In 1974, In Hyuk Suh decided to leave the fledgling organization he and his brother had founded in Korea, and move to America. In America, he could introduce Kuk Sool more easily to a public free of preconceived prejudices against the martial arts. Beforehand, Korean martial arts had little exposure in the U.S. In Hyuk Suh became very successful in his efforts, founding his own new organization a year later known as the World Kuk Sool Association. While In Hyuk Suh continued his efforts to allow Kuk Sool’s popularity to grow in epic proportions, the original Korea Kuk Sool Association, now under the sole authority of his brother, In Sun Seo, continued on and began to flourish throughout South Korea. Under the dedicated leadership of Grandmaster In Sun Seo, the popularity and respect for Kuk Sool grew rapidly. In 1983, Grandmaster In Sun Seo was elected to the presidency of the Korea Kido Association (first martial artist to serve as president) and has been serving for the longest duration in history. In 1986, Grandmaster In Sun Seo founded the World Kido Federation to serve as a link between the official martial arts governing body of South Korea and the international martial arts community. With the formation of the World Kido Federation, international practitioners of Korean martial arts can register their ranks and schools with an official Korean government-recognized organization, which will ensure permanent documentation of their martial arts history. Unlike some private organizations that have collapsed when their leaders pass away or leave the martial arts altogether, World Kido Federation's direct link to the government recognized organization in South Korea ensures legitimacy, continuity, and safety for all their members. World Kido Federation members enjoy registration of their records through Han Min Jok Hapkido Association, founded by Grandmaster In Sun Seo in 2003. The Han Min Jok Hapkido Association is a non-profit martial arts organization that is sanctioned by the South Korean government through the Ministry of Culture, and bestowed with the authority to historically verify, certify, and govern all of South Korea’s nationally recognized martial arts, including Kuk Sool and thirty-one other styles. Grandmaster Seo is the only first generation martial artist to teach and operate a do jang in Korea continuously for the last 40 years. He is the epitome of a true martial artist who combines his technical skills with great wisdom to tirelessly serve the growing martial arts community of Korea as well as the rest of the world. For four decades, he has continued his life’s work of discovery, research, historical verification, and documentation of Korea’s martial arts. He has received many accolades from the South Korean government and is formally recognized as the world’s foremost authority on historical Korean martial arts. As of present time, Grandmaster In Sun Seo has certified 270,000 Black Belts and he serves as President/Chairman of World Kido Federation, Han Min Jok Hapkido Association and Korea Kuk Sool Association. Grandmaster In Sun Seo continues to travel the world to teach and share his martial arts knowledge and skills. Grandmaster In Sun Seo’s personal philosophy embodies the very essence of true martial arts philosophy. He espouses the brotherhood of all martial artists worldwide, without regard to political, religious, ethnic, economic, or affiliation boundaries. It is with this true spirit of the martial arts that the Korea Kuk Sool Association, the World Kido Federation, and the Han Min Jok Hapkido Association offer their martial arts knowledge to all who would seek it.